it seemed that the reindeer were going on STRIKE!" For many families, reading The Night Before Christmas is a Christmas tradition, one that helps to put many children to bed early on Christmas Eve! The anticipation of Santa Claus coming down the chimney to deliver presents is enough for any child (and child at heart) to have a sleepless, Christmas Eve night, but what if Santa's reindeer went on strike? Who would help Santa deliver the presents? Lisa Trumbauer and Illustrator Jannie Jo create a twist on the classic tale, one that could easily become a classic itself. 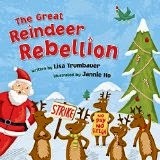 In this book, Santa's reindeer are tired of pulling Santa's sleigh and have decided to strike until their conditions are met. Santa, unafraid of the reindeer threats, decides to find help elsewhere. Santa tries out a pack of dogs, but they are soon easily distracted by the smell of food nearby. Next, he readies the cats, but they cannot resist the lure of a mouse. Perhaps a little crazier, Santa goes on to try out flamingos, kangaroos, and elephants, but nothing compare to the efficiency of eight reindeer. Trumbauer's lyricism echoes the original classic with creativity and charm. Ho's expressive illustrations with glossy, bold colors, bring the words to life to create an adorably memorable children's book.